Concrete Decor readers are actively looking for product training that will help them excel in their trade and grow their businesses. 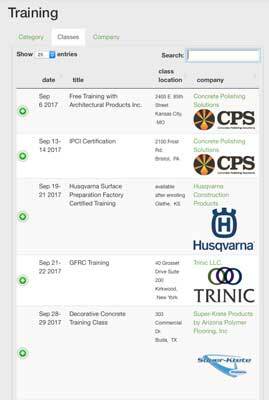 The Decorative Concrete Training Guide is the best way to promote your training classes to thousands of concrete professionals. Are you planning a training event at a supply store, at your facility or half way around the world? The Online Training Guide is the solution. The Online Training Guide provides a powerful schedule creation feature that allows you to create, update and review your online class schedule. You can log in to the training calendar anytime via the Intelligence Center to update class schedules, locations, trainers or descriptions. Online visitors can search for training classes by category, company name, state or trainer name. They can also search with keywords to help them instantly find the specific kinds of training they want to take. Once they find what they want, links take them directly to your company. The online upgrade is a powerful way to promote your training classes and events. 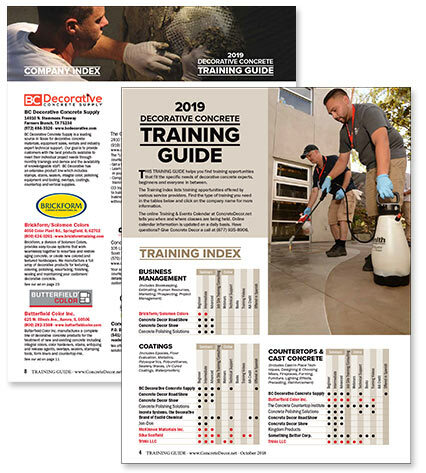 Get your training classes included in the 2019 Decorative Concrete Training Guide. Visit concretedecor.net/training-guide/ or contact your Concrete Decor Account Manager. Four times a year, a training-specific e-newsletter will be compiled from the Training + Event Calendar entries that you place on our calendar. Reaching 18,000+ opt-in subscribers ready to learn more, our e-newsletter targets your training schedule directly to our eager audience. Don’t be left out. Early each season, your training and events will be emailed to our database of e-newsletter subscribers. Your company name will appear in the Training Index under each of the topics you select. This section provides readers your contact information and a summary of your offerings. A description of up to 50 words is included. Basic Training Guide Listing (includes company name, description, address and one category) starts at only $195. Concrete Decor magazine’s Decorative Concrete Training Guide is prominently displayed on 25 Topic Sections that direct nearly 100,000 monthly visitors to the information they need quickly. Additional exposure for your training events is delivered throughout the year via Concrete Decor magazine, our twice-monthly Concrete Decor e-newsletters and on our social platforms that include over 25,000 followers. If your products are made “For Professional Use” then you need to have your educational events listed with Concrete Decor.